Minister of Finance and Media Mangala Samaraweera speaking on the interim report submitted by the Steering Committee on Constitutional Reform, recalled that Joint Opposition heavyweight Dulles Alahapperuma ardently advocated a new constitution and campaigned for the same along with the minister, former colleague Dilan Perera and the late Nalanda Ellawala. 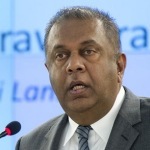 Samaraweera pointed out that the trio had traveled the length and breadth of the country trying to convince the people that a new constitution was necessary. “As an active member of the Sudu Nelum Movement, Dulles supported a new constitution that is actually more progressive than the this draft. He went from village to village advocating a constitution that replaced the word ‘unitary’ with ‘united’. 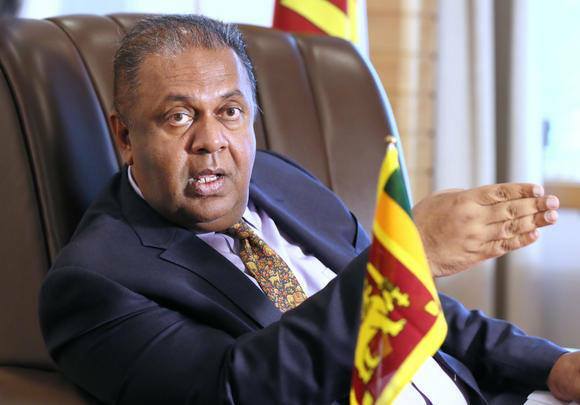 It was a proposal that advocated devolution of land powers and police powers,” Samaraweera said. He then quoted at length Prof G L Peiris‘ speech at the inaugural meeting of the Sudu Nelum Movement where he, Peiris said that all political parties have recognized that there is an ethnic problem in the country and it needs to be resolved. 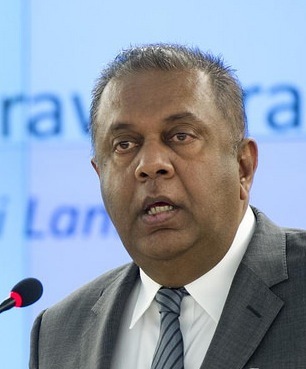 Avamangala Samaraweera is another thakkadi Hora in a two piece suit. they all know they are wating the day when they go to oblivion. So, preach to stupid LTTE rump because you have to pay debts. 1. Insurance for all Lankan School children to benefit foreign insurance companies and beggar Sri Lankan people further. Where on earth did this come from – Trump advisors who drafted Vision 2025 in Washinghton! 3. Avant Guard Marapana whose brother is lawyer of NamalJarapassa – bi-partisan UNP-SLFP Corruption networks. 4. Biometric ID which is a violation of privacy ruled as a fundamental right by India Superme court. Wimal Sangili Karuppan Weerawansa was seen outside the parliament protesting against the debate on proposed new constitution. He was seen boycotting the debate outside the parliament building. However, later he was seen having a hefty subsidized meal inside the canteen. How you can occupy valuable space with your vitriolic contributions I just don’t understand. It is such a pity that you use only one eye. It is by a quirk of fate that you were born a Sinhalese. What if the coin rolled over and you were a Tamil person instead? As the minority, would you take the current stand even then? State your piece, but be at peace with all. EU should RECALL its Ambassador to Sri Lanka, Tung-Laï Margue for his speech at the HOPE Exhibition!!!!! His speech is a DIRECT INTERFERENCE and a VIOLATION of the Civil and Political Rights of Sri Lankans. How dare he to use the word “short-sighted” to describe the Opposition who are against the Federal Constitution??? (1). The Constitution is the most crucial document which is the foundation that legitimizes the rule of any country. (2). It is the Constitution that limits the powers of a government that determines the relationship between state and citizens. (3). IT IS THE BLUEPRINT OF GOVERNANCE which shows the direction to the government whose duty is to follow that path. If the Sri Lankan Government introduces a new Constitution that converts the Unitary, Single State into a United, Federal State, Sri Lankan citizens and political parties have a LEGITIMATE RIGHT to oppose, as it ratifies the country being divided according to territorial rights, aerospace rights, naval rights not to mention conferring separate sovereign rights, legislature rights and judicial rights to 9 individual Federal Provincial States. How could EU Ambassador say opposing such Proposals which divide a Unitary Country is SHORT-SIGHTED???? EU Ambassador, Tung-Laï Margue has NO RIGHT WHATSOEVER to criticise individual decisions of people, or the Opposition, for listening to majority voters who oppose the Federal Constitution. EU, being the “Vanguard of Human Rights” and the most vociferous Organ in protecting people’s rights, should TEACH THEIR AMBASSADOR TO “RESPECT SRI LANKAN CITIZENS’ RIGHT TO TAKE THEIR OWN DECISIONS” WITHOUT BEING SUBJECT TO EU’s UNDUE MANIPULATION, INFLUENCE AND INTIMIDATION. Furthermore, he has no right to talk about politics of the host country let alone criticize the Opposition. This is a gross violation of the Vienna Convention. I repeat, EU should recall its Ambassador to Sri Lanka, FORTHWITH. All these constitution talk is to divert the attention from the Grand – Bank theft of Yahapalana thieves. I heard MY3 saying the way the things go, he may have to leave even without his shoes (he said sereppu). Investigation on the bond scam is going on you idiot. Nor the PM has also been summoned! Get a life, you lowlife. Isn’t your toilet practice keeping you busy enough? Look at the undiplomatic Prasad Kariyawasam, how pathetic he can be. Why didn’t the government withdraw this idiot when CPI rejected his apology? CPI on Thursday rejected the apology rendered by Sri Lanka’s High Commissioner to India on his remarks about alleged connection between some Tamil parliamentarians and LTTE and demanded he be withdrawn by his government immediately. Party National Secretary D Raja termed the remarks by High Commissioner Prasad Kariyawasam as a “gross interference in the internal affairs” of the country, particularly the work of Indian parliament. “The matter is so serious that the envoy’s apology is not acceptable. In fact, the government of India should take it up with all seriousness and demand that Sri Lankan government call back him from Delhi,” Raja said. The envoy apologised for his comments alleging “friendship” betweeen some members of AIADMK, DMK and MDMK and LTTE which, he said, should be investigated by New Delhi. Coming from EU does not necessarily mean that they are smart or intelligent. There are dumb people who do not know their role. I have no doubt, the EU will grant your request. I heard, Avamangala Samraweera is thinking about moving to Kaluthara. that is why he built the house around (seond one coming up now for the relative), around bolgoda lake. There is the fear that Matara voters may reject the LGBTQ boy. You should join L’web good entertainment !!! I have criticized L.Web editor some time ago. So, he doe snot let me write anything. He is also maintaning a some kind of ethnic enclave there. Please focus on the issue NOT mixing it LGBT or anything else.. Jimbumsy seems not sensing it let alone today. When would you grow up ? New consittution is a must. That was the thought of your mafia king too at the time, he had been ruining the nation during his terms. Not just that, even 20 years ago, CBK s efforts contained that a constitution should be a must. Then UNPrs stood against, while today, UNP has come to accept it while JO thakkadiyas as reborn ones stand against the new c today. However, whatever being said and done by JO are for their political greediness. They dont know care much about the people, Wimal WEERAWANSE the school drop out has been abused to manipulate the nation. He would like a bulldog being kept in front place to animate the blind and gulliable folks. His rherotics go viral as if a pop singer s melodies would outreach masses. Here what is being neglected is the outcome. Outcome to be healthy, professionals should help them sorting out. Lanken society is not yet that improved to sort them out clearly. I forgot to say, in order to complete the moving into Kaluthara, he appointed Faizer Musthapa’s brother toa Kurdishthan (where it is? ) as a consulate there Mahinda chintanaya all over again. If there was one man who has disgraced himself both politically and personally it is none other than Prof; G.L Pieris. Worse still, he is an Appendage of Ma Ra. I do not wish to be personal,but those at Panadura in the 50s, 60s, and 70s may know what went wrong with this Scholar par Excellence! Never mind the 50s, 60s and 70s, look at 2017 he is looking after Namal Baby. He is the super nanny, who spends most of his time with this political brat. Mainstream media and websites like CT should stop wasting time on the non-existent new constitution debate which is a big distraction from the root causes of Sri Lanka’s national problem. Corruption is the single biggest barrier to an INCLUSIVE and JUST society. Politicians have always used racism and hate speech to Divide, rule and distract the people from their corruption, and now they are using this fake new constitution to distract people from their Corruption.The current Jarapalanaya regime is fostering a culture of impunity for corrupt politicians, while playing ethno-religious games with a so called New Constitution to distract people from the financial crimes of Ranil Wickramasinghe and Mahinda Jarapassa who should be sent to prison for looting the country. Corruption of UNP and SLFP politicians is the reason for the culture of Hate speech and racism. The Education sector is wasting massive amounts of money to benefit foreign Insurance Companies under the guise of insuring School Children. Which Fake foreign development expert has recommended this scam to pile up more debt? Lankan Media, civil society and citizens should all unite to make the fight against Corruption of UNP and SLFP politicians the first and top National Development Priority, instead of being distracted by these corrupt politicians who play religious and ethnic hate speech games and whip up hatred to distract the masses from their corruption. Now in an era of Fake news and post facts we have a Fake New Constitution which is being used to distract people from the Corruption of the Politicians in the Diyawenna Parliament of morons who only travel in Duty free SUVs. Corruption is the main cause for the lack of equitable regional development and discrimination against people of all communities. Sooner that civil society realizes this the better. Bond scam Ranil and Avant Guard scam Marapona must be impeached and share a prison cell with Mahinda Jarapassa and his brothers and sons. Marapona’s brother is Namal Baba’s lawyer – the bi-partisan UNP-SLFP cozy CORRUPTION is so clear. Hi Kalu, You may be right. But do you think civil society and citizens would unite on one topic easily ? All get elected to parliament are the mirror image of the society. People I mean majority of them are over corrupted. Just imagine how many of them were easily animated for the last May day rally. What they used was just free food and bottle of arack. I think people to be blamed for lanken misery. And not to forget, MEDIA men are the most abusive institutions in the country. Dherana, Hiru and the like media institutions send the wrong message inciting the people. They dont send the facts and figures out to the people. Half baken stories and biased news have been telecasted and broadcasted. Please open your eyes, you will see what I have been telling is true or not. It is not only Dulles and GL who are turncoats, majority of the Sinhala cabinet are turn coats except for a few. They are fork tongued people. There are a few good men in the Sinhala society but they are voiceless. Why do we want a new constitution? The answer is to articulate and enshrine the voices of the Tamil Community of the North and East in the New Constitution as it should be the main focus. Although it is still in the steering committee stage, when it comes to a draft stage or the final stage, the Tamil people will know how to vote in such a referendum.If they find the new constitution will not be a favourite one for them they will vote against it. The constitutions of earlier era were not accepted by the Minorities and therefore they were invalid. They were not given a chance to vote for or against. As years gone by the majority race did not want to accede to the Minority demands, for the sake of the country. Tamils do not need a new constitution of power devolution or sharing. Tamils say they were in Sinhala even before the Sinhala people and they are the original inhabitants of Sinhale. So, occupy the whole sinhale as you do not. Do not try to have power devolution only to Orumiththa nadu and nasiristhan. Orumiththa nadu is unsustainable without artificial fertilizers which need southern money to import and when not southen Cowdung is not available. Tamils should say the whole Sinhala is their homeland and devolve power to eht ewhole country as they need power too. How sure are you that the next step of those with their dying desire of Federalism will not declare independence by 2050 like CATALONIA did…? How sure are you that the young Tamil diaspora spread in the World will not collectively march towards that objective by 2050 by setting fire to the already peaceful lives of the Tamils community in the South…and projecting it as the works of Sinhalese Extremists..? The old demented Farts who are articulating federalism today will not be in among the living by then..
Countrie which sorted out these issues immediately after their independence even though they were way behind us but today gone way ahead of us. All those opportunistic intellectuals and policians who use these issues for their selfish ulterior motives should be put in the gas chamber. These iodiotic characters wouldn’t let this country and its people to have a better life. They always thrive by creating divisions and prolonging issues. This they all are doing from the day we got independence. Relax Mr. Minister, 20 years ago rhetoric is practically invalid today, strong commitment of the majority is not 2 let devolution or @ least no on racial basis. Take minority 2 think whole island is traditional homeland & those not ready must be banished. It’s selfish & opportunistic intellectuals who want separation/support federalism in guise of devolution, it’s their idiotic characters that make impediments 2 better life in racially undivided country. If devolution is still felt in this small island just 3 or 4 units enough merging provinces but strictly non racial basis; those don’t tolerate living Sinhalese, Tamils, Muslims together must leave & live somewhere else as boot lickers/refugees as happening now. What’s the use of a new constitution when the same UNP/SLFP thieves will be running the country? Hisey kakkumata kote marukananava. Upright politicians will succeed under any constitution. The problem is that we don’t have any. Would you buy a used car from them lot?……. I mean Mangala , Kirriella, Galleon, Ravi, Mallika, Kabir and the boss Dr Ranil himself?……. Did you watch how pathetic , Dr Ranil’s Sales Talk is in Kotte yesterday?……. You not only sold tonnes of empty Mahinda Chintana over the past 10 years but also continue to sell MR, GR, BR, …..Dayan, Wimal, ……………………… as Cullinan I, Cullinan II, Cullinan III …………….. etc Diamonds, whereas they are in fact cheap Bongs not even good for smoking cannabis. On the other hand as a clan their wealth seems to exceed the total value of Cullinan I, Cullinan II, Cullinan III …………….. etc. What did you get as commissions? Now that we are running up to the festive season, wine and dine and parties, lets have some entertainment. The game is can you spot the Sinhalese Racist? Are there no Tamil racists? There were and there are, most of them had already converted to Sinhala/Buddhism. Thamil Maran, Jayampathi, Wickremarathna, Abraham Sumathiran , and Mangala met with the Global Tamil Government Delegation in 2013, according to the Diaspora Web page……. This all Vellala and Global Eelaam Diaspora Project………. Dalit Tamils are in the same boat as the Sinhala Buddhist Dalits. Because there is nothing there in it , for them..
Wonder whether Dr Rudrakumran was part of the Delegation……..
Father Emmanuel is in town. Have you started your horse trading with him? Whatever the constitution, the army will remain in the northeast and Tamils will continue to live under its jackboot as third class citizens. Hence they have to learn to survive. I doubt that this proposed constitution will survive this “constituent assembly”. Tamils asking for Federal Solution say ‘Federalism is not Separatism’. True. But there is no guarantee that Federalism will not lead to Separatism. In India where there is a Federal system, Tamil Nadu and Punjab wanted to separate and the Central Government crushed these separatist movements. I think In Sri Lanka, Veddas (Aadi Wasi) who are the native people have not been given the due place. There are evidences to believe that most of the Vedda settlements were scattered in the Eastern Province. So Eastern Province is not the traditional home land of Tamils but traditional homeland of Veddas. Even Muslims have no right to claim that it is their territory. Muslims are there thanks to King Senerath who allowed them to settle in interior parts of the country when they were persecuted by Portuguese. So declare Eastern Province as an Autonomous region and make the leader of Veddas the Governor. When, Where, How, did ………………….. the Central Government crush these separatist movements? You don’t have to answer if you don’t have the facts. Eagle Eye ~ “…………..In India where there is a Federal system, Tamil Nadu and Punjab wanted to separate and the Central Government crushed these separatist movements……….”. Central Government of India wanted to make Hindi as the official language. The then Madras State (now Tamil Nadu) threatened to secede. Centre withdrew the Hindi idea. The standoff ended. Believe me you. People were not herded, bombed or strafed. Discrimination or oppression were NOT the reason for Punjab’s secessionist movement. After the civil war ended, Punjab is left with highest percentage drug addicts in India. India is in one piece because of the federal form of governance. Bigger states are slitting up into more manageable units – there is a move to split Tamil Nadu into North TN and South TN. These people have submitted an interim report. Majority has refused it. they try to bring this crap in order to hide their failures. Yahapalanaya govt was sleeping with the west. that did not work. both the Hambanthota, Port city made humongous losses. Now the west brought constituion. This mouth piece for the west is brining that up when there is nothing. We have too see how dumb the how traitorous are the Matara voters are. In my lifetime, there were two new Constitutions enacted in Parliament. One was in 1972 and the other in 1978. In both those instances, to the best of my memory, there were not much consultations/discussions, and they were done solely via a vote in Parliament. They were introduced mainly due to the wishes of the then Leaders (SB & JRJ) and I believe such Constitutions may not have met the wishes and aspirations of the majority adult citizens of the country at the time. The current exercise is very different, in many ways, to the ones before, wherein currently there is widespread consultations, discussions and opportunities for the Public to air their views / criticise / engage in demonstrations etc. etc. Furthermore, as an act of pure Democracy in action (by virtue of provisions in the current Constitution), in addition to a 2/3 majority in Parliament, there will need to be a ‘Referendum’, for the general Public to vote ‘Yes’ or ‘No’. What more can one ask for in a Democratic Country? Inspite of ALL the rhetoric (good and bad), this Constitution will not get up unless majority of voting public vote ‘Yes’ ! So I believe all necessary safeguards are there to ensure the wishes / aspirations of the majority will prevail. I urge the voting Citizens to carefully study what is being proposed/presented and vote according to your own conscience (without being swayed by the rhetoric of selfish/corrupt Politicians) , bearing in mind not many opportunities will be presented to make a difference in the best interest of the COUNTRY. So please make your ‘vote’ count! GL a rudderless boat drifting in a storm has forgotten the past may be dementia will sink soon. GL Pieris has been appointed the official child minder to Namal Baby. Politicians world over change their principles at short notice to improve chances of fulfilling their ambitions – the ambition may be as simple as enhancing the personal wealth, in some cases protecting what has been accumulated. GL P switched sides at every election bar the last one. He managed to slither into center of governance which he enjoyed. The last elections probably his overtures were not answered and he stays put hoping rewards if there is a change. Dulles is trying to keep his wealth. Which of the trio Dinesh, DEW, Vitharna who threw principles, lost? Wimal never had any principles to throw! MR was at one stage a human rights activist. So, politicians who do not change are idealists and by definition are NOT politicians! In a socialist country, Ranil and this LGBT boy who is brining everything to destroy Sri lanka would go infront of a firing squad if not would be crucified as per roman laws. Because. this constitution is an american project led by an INGO called ITI. they have made constitution ecen in many countries in Africa.– One university Academic has explained the whole procedure some where. According to informants workers of A high end petrol shed close to a private hospital in Colombo 5 area was caught selling Oct.92 at Rs.150.00 per liter by a worker and the imformant an elderly fragile man requested a litre of petrol for his stuck vehicle ,he was refused even though he was Willing to pay the same amount asvtye lady driver ,when the consumer argued ,the worker had asualted him.and warned him not report to police as the owners are very powerful . Whenever there is any issues in the petroleum sector, no shed with enough stock should be allowed to refuse customers. sheds that have stock and refuse to serve the customers or close their sheds should be raided by special militarily squad appointed by the President and sheds should be acquired and handed over to the Navy, they are doing are super service with their shed or the army or Air force. At least they will do a better job without strikes and besides it will provide their own income too. BTW this is a trick The workers have been playing and the owners don’t care as long as they get their profit.